We all know how it is. You see a big bowl of steamed vegetables and think – Oh yes! That looks so good for me! But right next to it is a juicy double bacon cheeseburger. The decisions we have to make as adults aren’t always easy, are they? When we are faced with decisions like this, we have to ask ourselves; can any food actually prevent cancer? The answer is a resounding YES! Although some people like to think that simply eating certain foods will stop cancer in its tracks, there is no proof as of yet. However, there is plenty of research which has found that eating certain foods can help to lower your risk of developing cancer, and that’s some darn good news! Of course, when talking about the development of cancer, other things matter just as much as diet. You can’t eat broccoli and kale all day, then drink a quart of tequila each night and think that they will somehow cancel each other out. Weight control, stress, exercise, and a host of other things can all increase your risk of cancer, so you can’t kick cancer to the curb with diet alone. Diet does matter, however, so in today’s article, we are going to discuss which 5 foods are super heroes when it comes to lowering your risk of cancer. You might be make the “least likely to be kissed” list after reading this, but with so many good things going for it, you would be stupid to not add garlic to your diet. The same compounds that make your breath so stinky also contain agents that stop cancer causing compounds from forming inside the body. It has also been shown to increase the speed at which your DNA is repaired, and in some studies has even been shown to kill cancer cells outright. 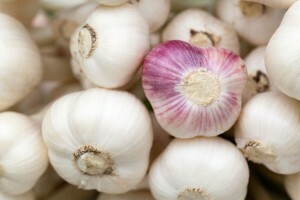 Garlic also kills the bacteria that has been linked to stomach cancer and colon cancer. To get the most out of your garlic, it needs to be chopped, sliced, or crushed. This releases the active ingredient. Wait about 15 minutes, then cook it or eat it to your heart’s content. By the way, eat real garlic cloves, not supplements. If your mom was always bugging you to eat your broccoli, she had good reason to! Cruciferous veggies such as broccoli, cabbage, cauliflower, and kale all contain powerful phytochemicals called glucosinolates. Glucosinolates produce enzymes that protect the body from cancer when you chew on them. 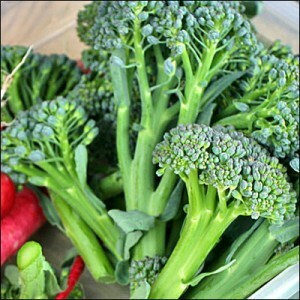 Broccoli and all of its relative protect the body from a wide range of cancers but are best known for protection from stomach cancer, mouth cancers, and cancer of the esophagus. You knew there was a good reason for Spaghetti Sunday’s! It’s the red color in tomatoes which make them a powerful ally in the fight against prostate cancer. Lycopene is the compound that turns tomatoes red and several studies have found that a diet rich in lycopene results in a lower risk of prostate cancer. 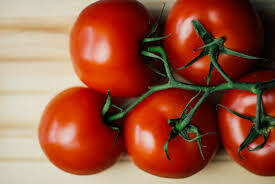 Lycopene has also been found in lab tests to stop breast cancer and lung cancer from growing. Researchers aren’t exactly sure how this works, but they believe that it protects the cells from damage by interfering with abnormal cell growth. Cooked or processed tomatoes work best here, so this is good news for lasagna lovers everywhere! Think Italian two or more times per week! Red to the rescue again! Although all berries have some type of cancer prevention benefits, strawberries are the cream of the crop, so to speak. 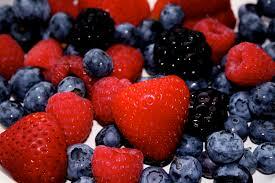 In one study, berry extracts were found to help protect against heart disease, memory loss, and fight cancer cells. To be specific, strawberries and black raspberries were found to have the biggest impact when used against colon cancer. Strawberries are rich in vitamin C, which supports the immune system as well as ellagic acid. Numerous studies have found that ellagic acid has powerful anticancer compounds which seem to turn on enzymes in the body that wipe out cancer causing agents. As we said, all berries have some type of anticancer benefit, so why not keep bags of them in the freezer and add handfuls to cereals, oatmeal, salads, yogurt, or just eat them out of the bag! Carrots are loaded with nutrients that fight disease. Cell membranes are protected toxin damage by beta-carotene. This compound is also found to slow the growth of existing cancer cells. Carrots also contain phytochemicals that fight oral cancers, stomach cancer, and cancer of the esophagus. Some studies have even found that carrots can protect women from cervical cancer. 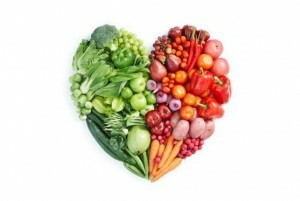 Like tomatoes, carrots pack more antioxidant power once they are cooked. Steam or cook carrots whole, then slice them afterwards for more antioxidant punch to your carrot bunch. This popular leafy green is rich in carotenoids, lutein and zeaxanthin, which remove free radicals from the body before they cause damage to cells. Spinach, and other dark green leafy veggies, also protect the body from cancer of the esophagus, stomach, and oral cancer. One study found that those who ate more spinach were less likely to develop esophageal cancer. Spinach also contains folate and fiber, both of which are known for reducing the risk of certain cancers, especially colon cancer. 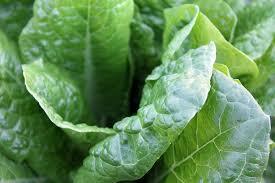 Folate helps the body repair DNA and make new cells. 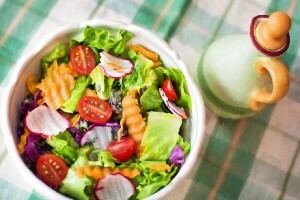 Pregnant women especially need folate to prevent birth defects. You can get the most out of your spinach by eating it raw, so add some to your salad every day for some super cancer prevention power you can count on. OK, so there are no big surprises here, but when was the last time you had any of these foods on your plate? Be sure that you add them as often as possible for the natural health you deserve.